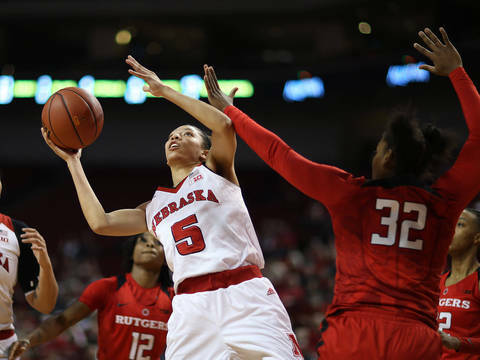 The Nebraska women’s basketball road warriors continued their winning ways away from home with a 52-42 upset of No. 25 Rutgers on Sunday evening at the Rutgers Athletic Center. Nebraska’s eighth consecutive road win was also the first home loss of the year for the RPI No. 11 Scarlet Knights, who entered the game 12-0 at the RAC. The Huskers, who led for the final 35 minutes of the game, improved to 14-6 overall and 5-2 in the Big Ten with their seventh consecutive true road win. Rutgers slipped to 17-5 overall and 5-3 in the Big Ten with its second straight loss since being mentioned as the No. 15 seed in the first NCAA Tournament Seed Selection announcement on Thursday. Nebraska’s victory marked its second straight win over a top-25 opponent, following a 74-65 win over No. 20 Iowa in Lincoln on Tuesday. It marked the first time since back-to-back wins over ranked Michigan State and Iowa teams in the 2014 Big Ten Tournament semifinals and finals that the Huskers had beaten top-25 foes in consecutive games. Freshman Kate Cain, a 6-5 center from Middletown, N.Y., led Nebraska with 14 points on 6-of-10 shooting while adding a team-high eight rebounds and three blocks. Cain capped the victory with the Huskers’ final two points with 40 seconds left to give Nebraska its first double-digit lead of the day at 52-42. Cain also played a major role in holding the Scarlet Knights scoreless in the game’s final 5:45. Senior Jasmine Cincore added 11 points, seven rebounds and two steals to help the Huskers find enough offense against the Big Ten’s best defense. Cincore hit 5-of-11 shots from the field while holding Rutgers scoring star Tyler Scaife in check on the defensive end. Although Scaife scored a game-high 20 points, she hit just 8-of-26 shots from the field and committed three turnovers with Cincore and sophomore Nicea Eliely playing primary defense. Eliely also gave the Big Red a big boost on the offensive end by going 4-for-4 from the floor, including a huge three-pointer with 6:20 left in the game to push Nebraska’s lead back to 45-39 after the Scarlet Knights had trimmed a seven-point deficit at the end of three quarters to just one possession. Nebraska’s edge on the boards allowed the Huskers to overcome a 20-10 deficit in turnovers. For the game, Nebraska hit 46.8 percent (22-47) of its shots from the field, including 4-of-13 threes (.308). Nebraska also went 4-for-6 at the free throw line without attempting a free throw in the second half. The Big Red held Rutgers to just 29.3 percent (17-58) shooting, including 3-for-14 in the fourth quarter. Nebraska limited the Scarlet Knights to just seven points in both the first and fourth quarters of the game to work its way to victory. Rutgers went just 3-for-12 from three-point range and 5-for-11 at the free throw line. Outside of Scaife’s 20 points, RU’s next leading scorer was Greene who finished with six points on a pair of threes. Scaife continued to score to open the second half, scoring six quick points to cut Nebraska’s lead to 31-29 with six minutes left in the third quarter, but Cincore answered with four straight points to push NU’s margin back to six. Cincore added NU’s final two points of the quarter with 19 seconds left to send the Big Red to the final period with a 42-35 lead.